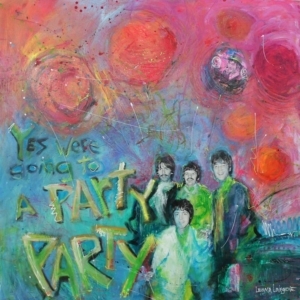 One of the paintings in my Beatles series is Party Party. 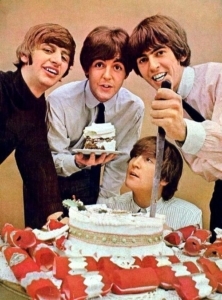 It’s based on the song Birthday from the Beatles’ White Album. There are many reasons this song resonates with me. First and foremost, I like the Bluesy vibe. Second, the song has history. 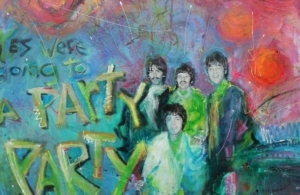 In art circles, we’d say it has a certain “provenance” that makes it unique in the context of the Beatles’ songbook or anthology of work. What sets this song apart from those created before and after is that it was the last song that John and Paul actually collaborated on together. 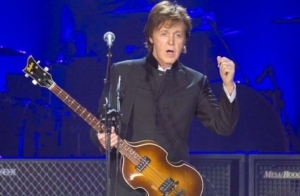 As the story goes, the group had plans to go to Paul’s house with several friends to watch a rock ‘n’ roll movie by the name of The Girl Can’t Help It, but they had some time to kill. They were in the recording studio and knew they didn’t have time to compose anything too complicated, so they came up with a simple Blues’ riff reminiscent of Roy Orbison’s Pretty Woman and Little Richard’s Lucille. 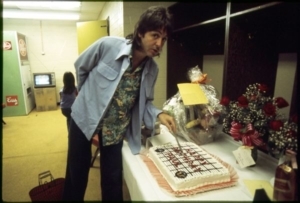 Paul said later that he thought it was one of their friend’s birthdays, but if so, he couldn’t remember who, but they started the song, went to Paul’s to watch the movie, and then returned to the studio later that night and finished the song in the wee hours of the following morning. In all, it took them just a scant 11 hours to create a classic that’s played again and again and again. That’s also true of creating art. There are times when one of my paintings takes weeks to conceive, plan and execute, and there are other times when the process flows so naturally that the canvas almost paints itself. Why the difference? Often, it’s simply a matter of whether I am able to tune out all the other stuff that I have going on in my life. When I’m “in the moment,” I’m oblivious to everyone and everything. In fact, I’m not even aware of the passage of time. I look up, the painting is done, and only then do I notice that it’s dark outside and I’ve worked through lunch and dinner. Party, Party fell into the latter category. 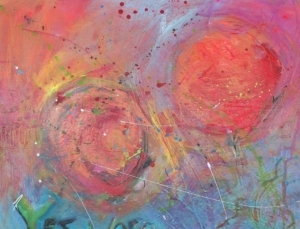 I was experimenting with circles and spheres, and the colors, the forms and the arrangement flowed organically. Without getting too technical, circles are two dimensional whereas spheres are 3D. Creating the illusion of depth when painting has got nothing to do with the color(s) you use. It’s all about getting the light and dark values right. The difference between painting a circle and a sphere is the use of a range of values which creates the illusion of a three-dimensional object on a two-dimensional canvas or sheet of paper. By having a series of values (or tones) from light to dark, what you paint looks like a sphere or ball rather than a flat circle, as the detail from my painting shows. This is a fundamental principle of good design, which is what the painting is designed to illustrate. By the way, this painting is a multi-media composition. That’s because I glued magazine cut-outs of John, Paul, George and Ringo’s heads and then painted the canvas surrounding them in oils. Transferring newspaper and magazine images into a painting was once considered a no-no, but groundbreaking artists like Robert Rauschenberg changed all that beginning in the 1960s.